You haven't lived until you've made your own tortilla chips. And once you try these, your standard industrially-manufactured Tostitos will never taste the same again. These chips are best when eaten just a bare minute or two after they've been cooked and seasoned to your liking. The hot oil caramelizes the starches in the corn tortilla, giving these chips a subtle, slightly sweet taste that you'll never find in the store-bought version. 1) Heat oil in a deep, non-stick pan to medium/medium-high heat. Use enough oil so that it is at least 1/2 to 3/4 of an inch deep (note: do not heat the oil so much that it begins smoking). 2) Drop handfuls of tortillas at a time into the oil. Flip them over as necessary. 3) Fry until golden brown. Drain on paper towels and season with a dash of salt, pepper or other desired spices. 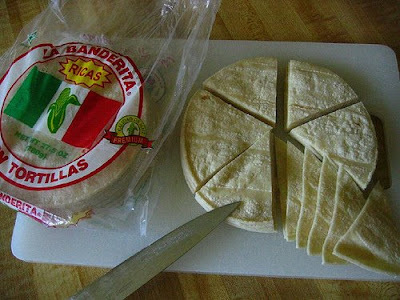 1) Don't confuse flour and corn tortillas. You must use corn tortillas for this recipe. 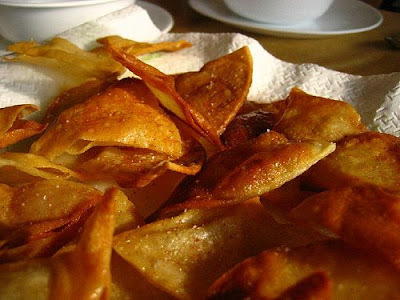 3) These chips are made the same way our Tapas-Style Potato Chips were made, except that you can make these guys even more quickly and easily. But note that because they cook through in just a couple of minutes, you've got to stand there and keep an eye on them. 4) On seasonings: You can use whatever seasonings you choose, and I encourage you to experiment. However, I don't recommend oversalting--it will mask the subtly sweet taste of these chips. We used just a few flakes of kosher salt and a few liberal shakes of cayenne pepper. Pure heaven. You can try all sorts of spice modifications: thyme, hot curry, chipotle powder, cumin, paprika--or a combination of any or all of the above! 5) Frugality alert: You don't have to dump out the oil after just one use. We've reused frying oil up to four or five times without problems. In fact, on days when we're feeling particularly lazy but still want to have tortilla chips or patatas fritas again tomorrow, we'll just leave the oil in a covered pan and reheat it the next day. 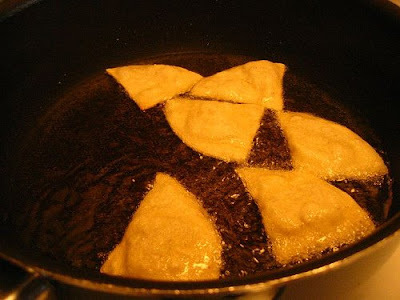 Obviously, though, never leave hot oil unattended in the kitchen, especially if you have young kids in the house. 6) I'd be remiss if I wrote a fried food recipe and I didn't address any health and diet questions surrounding the type of oil I used and why. Since I can quickly see this issue going way beyond the scope of a simple recipe post, I'll leave you with a one-sentence rule of thumb: Try and always use oils that are liquid at room temperature, because they're more likely to stay liquid when they're floating around in your arteries. I used corn oil (rather than olive oil, which I typically prefer) because it smokes at a higher temperature, and thus is better suited for deep frying. Oils which are solid at room temperature, including hydrogenated oils of all types, may have certain shelf-life and culinary advantages (especially for industrial snackfood manufacturers), but they have few redeeming health advantages. Those are the types of oils I generally avoid, except in rare instances. If you enjoy reading Casual Kitchen, tell a friend and spread the word! Another way you can support me is by submitting this article, or any other article you particularly enjoyed here, to bookmarking sites like delicious, digg or stumbleupon. If you can find it in your hispanic section of the store, or in the hispanic store, or make your own (they make powered lime juice now), I suggest a lime/chili/salt mixture. It's great for these (it's usually used on corn or jicama), I use it when I bake my tortillas (I very rarely fry since I was burned when my mom was frying chicken when little). Oh, I agree--not only are homemade corn chips MUCH tastier than store-bought, they're also much cheaper! I can buy a package of fresh corn tortillas for $1--which makes a huge amount of chips! Lady Di: Lime juice is a great idea! Just like Tostitos Hint of Lime but homemade and better. Thank you! 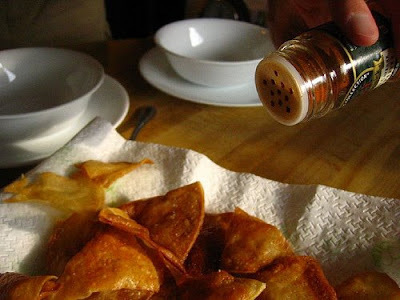 I googled "how to fry your own tortilla chips" and it lead me to your blog and you explained everything perfectly! I'm using a deep fryer (I just bought!) and grapeseed oil. If you have any pointers re: these few things, they'd be greatly appreciated. I'm going to try my hand at taquitos too. I'm sort of shooting blind here... thanks again! Hi Angela, thanks for your comment. I've never used grapeseed oil, but I'd just carefully read the instructions on your deep fryer and see what oils it recommends you use and if there are any varying suggestions for handling different kinds. Good luck! I'm from Texas and I do love a good homemade tortilla chip... However, since I LOVELOVELOVE flour tortillas, I make my own baked flour tortilla chips. I cut the tortillas in sixths or eighths, depending on how big they are, spray them with oil and sprinkle them with salt, and bake about 12 minutes until they're brown and crispy. They're divine. 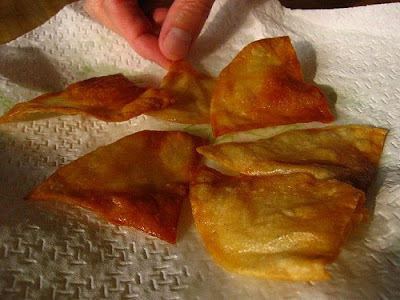 I may have to try the technique with corn tortillas (not a terribly big fan of frying since I have high cholesterol).